Atriplex canescens (Pursh ) Nutt. Trunks: Shrubs, usually dioecious, rarely monoecious. Stems ascending to erect, much-branched from base, silvery-scurfy. Leaves: Cauline, alternate; petiolate or sessile; blade lanceolate to oblong or obovate, 1 to 1.8 inches long, .12 to .28 inch wide, base tapered, margins entire, apex obtuse to acute, surfaces silvery-scurfy. Flowers: Inflorescences axillary glomerules and/or terminal spikes or panicles. Flowers unisexual, staminate and pistillate on same or different plants. Staminate flowers .07 to .09 inch: tepals 3-5, connate basally; stamens (3-)5. Pistillate flowers: tepals 0; bracteoles 2, prominently 4-winged, .3 to 1 inch, herbaceous at maturity, margins entire to dentate, face smooth or reticulate; style 0; stigmas 2. Fruit: Fruits Bracteoles that persist and enlarge with age, enclosing ovary, usually indehiscent, not folded together along the long axis; seed 1, brown, .09 to .11 inch. Uses: Native Americans applied a poultice of leaves or flowers to ant bites; applied a poultice of warm, pulverized root to toothaches; and made the leaves into a soapy lather that was used to wash the hair and to treat itches or rashes. 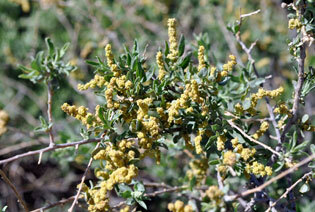 The Navajo used the young leaves and twigs to dye wool yellow. Comments: Atriplex, an ancient Latin name, and canescens , hoary. Kansas plants are the widespread var. canescens.